On Monday, we posted the results of a bike helmet safety survey we ran through May is National Bike Month. According to the survey, although nearly 70 percent of cyclists in California say they wear bike helmets most of the time, few think that state law should require them to do so. This holds true for media anecdotes about bike helmets. Last year, for example, Los Angeles Mayor Antonio Villaraigosa was booed at a bike conference when he announced his support for a statewide law requiring helmets for all cyclists. 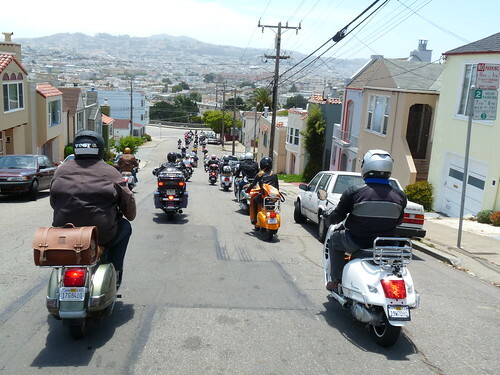 California’s motorcycle community faces a similar helmet debate that pits safety advocates against riders who demand the right to ride without a helmet, regardless of the risks. Currently, California law requires motorcycle helmets for all riders, as do 19 other states nationwide. 27 states require helmet use for riders under a certain age (usually minors), and only three states don’t have any helmet law on the books. Below is a quick rundown of each sides of the motorcycle helmet debate. Motorcycle helmets saved an estimated 1,829 lives in 2008. Helmets would have saved an additional 822 lives if all riders were required to wear helmets. Helmet use led to nearly $3 billion in cost savings nationwide in 2008 alone. If all motorcyclists wore helmets that year, they could have saved an extra $1.3 billion. Traffic fatalities have decreased for other types of vehicles since 2000. But motorcycle fatalities have nearly doubled during that time. Motorcycle deaths now comprise about 14 percent of all traffic fatalities, a disproportionate figure considering that motorcycles make up only 3 percent of registered vehicles in the US. Helmet laws reduce the number of motorcycle riders. The California DMV predicts, for example, that there are 40% fewer riders today than 1992, when the helmet law was passed. Since the helmet law went into effect, the fatality rate has not dropped in California. In 1992, the rate was 3.22 per 100,000 riders; now it’s 3.84 with far fewer riders. Motorcycle deaths cannot be considered a public health issue, since they only impact the driver who chooses to ride without a helmet. If a motorcycle rider is involved in a high-speed collision, the chances are that even a helmet would not be able to prevent death or serious injury. As the writer of a traffic safety blog, I’m clearly more inclined to think that the evidence points to the fact that motorcycle helmets save lives, so the government should require their use in the interest of public safety. But I’m interested in your thoughts. Let us know what you think in the comments section or on our Facebook page. And while you’re here, check out our interactive calendar of California summer motorcycle events. I have been riding for 32 years and frimly believe the helmet law was bought by the insurance companys and sold by the Gov. of CA. The helmit law is not about saving lives (it never has been) it is about the insurance companys making more profit. The insurance companys do not care about an indvidual life. Plain & simply. Anyone of age should be able to make his or her mind up whether to wear or not wear a helmet, it’s their life that is on the line, their decision, not the state of California. I’m sure in some instances, wearing a helmet can save your life, however, if it’s all about safety, you could make the same argument that requiring people to wear three point seat belts and full face helmets in automobiles would do the same. I would be more in favor of a relaxed helmet law, perhaps requiring an actual protection helmet for the first two or three years of a motorcycle license and then optional usage determined by each individual rider. I think helmets create more problems than they solve. Skull caps catch the wind and require the rider to fight the backwards pressure causing greater fatigue. Chin straps are uncomfortable and come just short of strangulation as the wind pushes the helmet up and to the back of your head. Wind noise where the straps cross the ears is annoying at best and reduces the ability to hear common or concerning traffic sounds. Full face helmets create tunnel vision, can be heavy and isolate the rider from the warning sounds of approaching traffic and emergency conditions. Helmets also invoke a false sense of security, stimulating throttle action and increasing speed. Invincibility is marketed with and built in to a $400 helmet, yet nothing could be further from the truth. I have logged 50 years on a Harley-Davidson without incident, and felt much safer when my only safety gear was a well fitted pair of sunglasses. Helmet laws are passed by politicians that generally have no two wheel experience and researched by staff members that are bent on obtaining results geared to getting the politician reelected. Stats do not reflect the laws validity and the freedom to choose should remain in the hands of the sovereign citizen not legalese. The key to motorcycle riding safety should be crash avoidance, instead of how to crash better. Helmets are either out of the equation, or reduce avoidance capability. This stated from Many years of experience riding with and without a helmet. Let motorcyclists enjoy their sport; they aren’t even on the list of 10 most dangerous sports. I have to wear a helmet but you get to smoke cigarettes?